Structured Negotiation and Lainey’s experience with digital accessibility has attracted the attention of the legal, disability, mainstream, and digital accessibility/usability media. This page includes an image of Lainey Feingold during an appearance on Canadian public television on The Agenda with Steve Paikin. Find links to this show, as well as other media and podcast interviews, in the list below. Find links to Lainey’s recorded presentations on the Speaking Page. July 27, 2017 interview (captioned video) on Web ABLE.tv for 27th anniversary of the Americans with Disabilities Act. March 24, 2017 interview (captioned video) with Christopher Schmitt on the Non Breaking Space podcast. 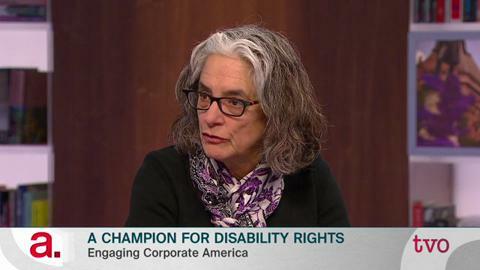 March 13, 2017 interview (captioned video) on Accessible Media Inc. in Toronto. February 13, 2017 Interview about Structured Negotiation on the Canadian public television show, The Agenda with Steve Paikin. January 17, 2017 interview on Disability Matters with Joyce Bender. January 4, 2017 interview on San Francisco NPR station KALW’s Cross Currents with host Hana Baba: “Local disability rights lawyer offers alternative to lawsuits” Transcript included. In February 2015 Lainey was interviewed by British accessibility expert Jonathan Hassell for inclusion in his text and video-based book Including your missing 20% by embedding web and mobile accessibility. Watch the captioned interview with Lainey Feingold about Structured Negotiation. In April 2014 Lainey was featured as part of the podcast series conducted by Sarah Horton and Whitney Quesenbery, the authors of A Web for Everyone. You can read a transcript or listen to the April 2014 Web for Everyone podcast and transcript about Structured Negotiation. In August 2013 the New York Times published Lainey’s letter to the editor about the digital divide and people with disabilities. Read the post about the disability digital divide and the New York Times letter. In December, 2013, the American Bar Association profiled Lainey Feingold and Linda Dardarian’s Structured Negotiation achievements. Read the ABA Journal article about Structured Negotiation. Also in December 2013 the Access World Magazine, published by the American Foundation for the Blind, included a profile titled ‘Lainey Feingold: The Power of Structured Negotiation’ by journalist Deborah Kendrick. Lainey’s work was also featured in two articles about Structured Negotiation appearing in the legal press in 2007. Read the Law.com article about Structured Negotiation. Read the Daily Journal article about Structured Negotiation.